Halloween 2007 pictures available in the private section of the photo gallery. Have a safe one ghosts and goblins! Since I was already getting Leopard questions from people, I decided today was the day. There are tons of great stories online about this, so I’ll just hit the main points of my experience. First off, I always do a complete backup of my drive before proceeding with a major upgrade like this. I used to use Carbon Copy Cloner, but now mainly use Super Duper! by Shirt Pocket. Mr. Bombich has a new version of CCC out, though, that also looks very nice. Based on the preceding paragraph, you can probably tell that I’m not that excited by Time Machine. Since they dropped the ability to back up to an Airport-attached drive for now, I haven’t even turned on that feature yet. Should be good for the general Mac population, though. Definitely a good time to be a drive manufacturer. Once properly backed up, the upgrade procedure went smoothly for me and took about an hour. I installed the one software update, restarted again, then started testing all of my primary applications by going down the dock and launching stuff. Not sure what all the fuss is about the fake 3D look of the dock when placed on the bottom. The first thing I do on a machine is turn on hiding, so I never see the damn thing anyway. I don’t earn my living using the dock–I need my real apps to work and I need to be able to manage my work flow (switching between apps, moving files, etc.). Two things in Leopard will be very useful for this: Spaces and Quick Look. Both are much better than I was expecting and I will use them daily. The transparent menu bar must die. That last one is the biggest one for me, as I use that to connect to Los Angeles. VPN to the St. Paul site using the built-in L2TP connection works fine. Other things that just worked or are improved in Leopard: printing, wireless access, all of my primary Adobe apps, BBedit, Transmit, NetNewsWire, Word and Excel, Pages, Remote Desktop, Mail, iChat and iCal. Those last three are especially nice compared to the Tiger versions. Dashboard is a mixed bag–the fonts in some widgets are way off now, while the new movie widget is very fast and I love the new ARD widget (this may have been available before Leopard, but it’s very nice). I’m anxious to get my servers upgraded to Leopard to check out the Server Status widget. That’s about it for now. I’ll post updates here as things get patched or other issues pop up. UPDATE: Decided to dump Parallels for now and install XP under Boot Camp. Took a long time to set up, but it’s very fast. Also set up Time Machine with a new external hard drive. That took several hours to do the initial backup (around 160GB) and now I just need to wait to see how it works in practice. Found out my issues with web development testing using localhost were caused by Apple switching to Apache 2 as the default instead of 1.3. Still tweaking that, but it’s mostly working now. It’s been a beautiful fall in Minnesota. Awesome colors, warm temps and a few unexpected rounds of golf before the snow arrives. Speaking of golf, the Golfing in Minnesota website that I publish now has Google Ads (I make money each time an ad is clicked) and Amazon links (I make a commission on each purchase made when someone clicks a book and buys it). Neither of those things will solve my money goals, but it’s a start. I’m anxious to develop other advertising ideas for these sites and get the next wave of Minnesota lifestyle sites launched in the next month or two (hockey, running, skiing and food). Work has been getting a little better (hope on the horizon) and I will be heading back out to LA soon. Coming soon: Halloween 2007, Hanz Erik Update, Leopard Impressions and Mini Brake Repair. A week ago, it was the senior professionals competing in Florida. This week it was the assistant pros. The TaylorMade-adidas Golf PGA Assistant Professional Championship was held October 25-28 at the PGA Golf Club in Port St. Lucie, Florida. Five Minnesota assistants qualified to play for a purse of $100,000 on the 6,754 yard Wanamaker course. Joe O’Brien of Minneapolis Golf Club was the only one to make the cut, placing T20 with a three-over 291 and earning a check of almost $1,000. I played my first round of the year at Willingers Golf Club in Northfield and now have played back-to-back rounds there to finish the year (although the forecast does look nice next week). The changes to the clubhouse have turned out very nice. It’s not quite Legends Club nice (also owned by the same people), but it is an improvement on the old setup. We’ve always wanted to play the tips at the end of the year and we did for both rounds. Playing to 6,809 yards with a rating of 74.4 and a slope of 150, these tees present a totally different playing experience from the whites (5,936 yards) and the blues (6,310 yards). The most striking differences in my opinion are the first, ninth, twelfth and fifteenth holes. Each of these gives a very different perspective off the tee and makes precise driver shots even more important. Very fun. Last weekend I took my youngest daughter on a trip to Cannon Falls that included one of the best kept golf secrets in the metro area. The Summit Golf Club has a well-maintained, entertaining par-3 short course that is perfect for kids. Best of all, up to two kids play for free with a paying adult ($10). The kids have fun and I get to practice my short game. Plus we usually stop at Greg’s Meats for their award-winning beef jerky and the Cannon Falls Hi-Quality Bakery for mint brownies and Special K bars. How can you go wrong? In a tournament beset by weather issues, several Minnesotans made the trip south to the PGA Golf Club in Port St. Lucie, Florida to play in the Callaway Golf Senior PGA Professional National Championship. Mike Barge of Hazeltine National was tied for third after the first round, shooting a five-under-par 67. The next few days weren’t as kind, but Barge did make the cut and tied for 17th, shooting 67-73-74-71-285 (-3) and winning $3,230. Mike Zinni of Mankato Golf Club also made the cut and tied for 25th, shooting 70-70-74-73–287 (-1) and winning $2,435. Two other Minnesota Section members qualified for the event, but did not make the cut (145): John Dahl of Oxbow Country Club in Oxbow, ND, shot 81-68-149 (+5) and Brad Schmierer of Hastings Country Club shot 76-71–147 (+3). Bill Loeffler, owner and operator of the Highlands Ranch Golf Club in Colorado, won the event, shooting 72-66-66-72-276 (-12) to win the $20,000 first prize. 2004 Minnesota Section PGA Teacher of the Year, co-host of KFAN’s Tee to Green show and all-around good guy Craig Waryan left Minnesota last week for his annual winter teaching season in Arizona. 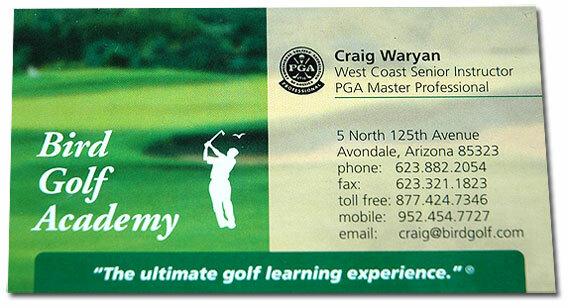 The Edinburgh USA master professional teaches at the Bird Golf Academy in Avondale, Arizona, during the winter months. Last week we visited the private Dellwood Hills Golf Club in Dellwood, Minnesota. Located next door to the Donald Ross designed White Bear Yacht Club, Dellwood Hills is a long Don Herfort course that has several holes in the process of being upgraded based on plans by Garrett Gill and Paul Miller. The par five eighth hole is receiving the bunk of the changes, with the green-side half of the hole completely under construction. The green is being rebuilt, the pond made larger and fairway contours reshaped. The hole is currently being played as a par four with a small temporary green in front of all the activity. The first and tenth holes also had some construction along the shores of the pond that separates them. This was the first time I’ve visited this course, so I’m not sure what this looked like before. A train track bisects the course for the first time between the second and third holes. I also noticed something unique in that all four of the par three holes are grouped together in this same area. The course, built in 1970, winds through a lot of nice, quiet, wooded areas and never seems too crowded by houses. Some of the areas were a little soggy, but the overall condition of the course was very nice. The clubhouse and practice areas were great and I really liked the finishing hole. I didn’t have a camera with me, but the view from the 18th tee is one of the most impressive in the state. Thanks to Dellwood pro Jay Norman for supporting charity golf and providing the certificate we purchased in a silent auction earlier this year. Not a great weekend weather-wise for running events, but we had a good time anyway. Saturday was rainy, a little warm and very humid, while the big races on Sunday started out at 72 degrees with 87% humidity and got worse from there. The whole family headed down to the capital on Saturday to attend the kid events. The tall one ran the 5K with me in just under 40 minutes, while the short one ran the one miler with me for the first time. Both needed a little encouragement to finish, but everyone was very proud afterwards. I knew three people running the full race. Congrats to the two Miller wives for making it all the way despite the heat (even though I’m sure they are unhappy with their times, which were about 25-35 minutes slower than they planned). My co-workers friend wasn’t as lucky–he got black-flagged and the medics forced him to quit. Cheering for people on Sunday along Summit almost got me excited enough to start training again. This weekend we visited Valleywood Golf Course in Apple Valley. You would have never known it was early October in Minnesota–sunny and 87 degrees with a course packed with people. Unfortunately, that also created slow play issues that required a phone call to the clubhouse to help resolve. Valleywood has always been a tough course for me to figure out. The course slope and rating from the regular “MGA” tees is relatively low–69.4 and 125. Aside from the very long par 4 eighth (420 yards) and par 4 ninth (450 yards) holes, the play on the front nine supports the easier rating. Make the turn, however, and you hit some very challenging holes where it is easy to run up high numbers. The par 4 tenth demands a strange angle shot off the tee and has water along the right side all the way to the green. The par 5 fifteenth calls for a strong tee shot short of the water and then a good long iron to clear it and get close to the green. Seventeen and eighteen are dog-leg target golf holes that confound me to this day. I played them Saturday at +1, so maybe I’m finally starting to get a clue (5-wood off the tee on both). Aren’t you supposed to let your boss win? Edinburgh USA professional Adam Guili defeated Edinburgh Director of Golf Don Berry 1-up yesterday to win the 2007 Minnesota PGA Match Play Championship held at…Edinburgh USA. Guili beat last year’s champion Jeff Sorenson of Columbia, while Berry earned his way to the final by defeating Mendakota’s Dale Jones 2 and 1 (full bracket here). The senior and assistant match play tournaments were held September 25-26 at Wayzata and Minikahda, respectively. Brad Schmierer of Hastings Country Club successfully defended his Senior Match Play title by defeating Mike Barge of Hazeltine National 2-up, while Eddie Wynne of StoneRidge Golf Club defeated Ben Meyers of Medina Golf and Country Club 2 and 1 to win the Assistant’s Match Play title.